ON THIS DATE (October 1, 1978) ... The long hard summer has come down to a heart-to-heart duel. It has been asked to be settled in one day. 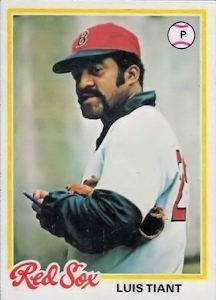 The showdown was made possible as the Red Sox ripped off their eighth straight victory, a 5-0 Luis Tiant shutout of the Toronto Blue Jays. At the same time the Cleveland Indians were shocking the league-leading Yankees 9-2, leaving the Red Sox and Yankees with identical 99-63 records. Three Blue Jays reached base all afternoon off Luis, two on singles, one on an error, and none of them got as far as second base. 29,201 chanted and sang thru homers by Rick Burleson and Jim Rice to the final out that settled in Jack Brohamer's glove in the rain. El Tiante put on his show. With every pitch he took longer and longer peeks at the scoreboard. Don Kirkwood matched El Tiante pitch for pitch until the fifth inning. Butch Hobson singled. George Scott hit a hard hopper to secondbaseman Dave McKay that rattled of McKay's ankle into center field. That was the Sox's big break, instead of a doubleplay. Jack Brohamer hit a soft grounder that allowed Hobson to score. Bob Bailor moved closer in right field and Jerry Remy jacked a liner past him that one hopped into the Jays' bullpen for a ground-rule double and the second run. But today, it was Luis, only one was enough. He went out and pitched a two hit shutout. A single up the middle by Roy Howell broke up his no-hit bid in the fourth. John Mayberry ripped a single in the eight. But that's all El Tiante would yield. Not one walk, striking out four. Seventeen of the 27 putouts were ground balls or pop ups. The Blue Jays never had a chance. The Red Sox had to win their last eight games. They did, with four shutouts and a staff ERA of 2.46 Both the Yankees and the Red Sox rode a rollercoaster all season long. They finished tied.